All the pictures on the pages provide details of where they were taken if you hover a cursor over them and they can all be clicked to open a larger version in an Overlay (Lightbox) or Popup Window. The image display options can be set on the settings links at the bottom right corner of every page which includes pictures. The 'Spanner' icon or the following link takes one to a page covering the Image Display Options in more detail including bandwidth reduction. Leaving Valparaiso on 16 February the next port would be Papeete in French Polynesia on 26 February. This would be a large number of days at sea, even more than a transatlantic crossing. Fortunately the seas were calm and the winds were light until we reached Easter Island on 20 February. It is over 3700 kms from Valparaiso which is almost exactly due east. The island has three sides, each about 10 miles long. The south coast has most of the interesting ruins of Ahu, the village burial sites and ceremonial centres, and the famous moai, the massive carved figures that probably represented ancestors. Moai can vary in length from 2m to the largest which is 10m. Although originally standing, the figures were then all thrown from their platforms. Those which are standing have been restored. There are two quarries. The volcano Rano Raraku is the quarry for the hard tuff from which the moai are made. The volcano Puna Pau quarry was used to make the reddish, cylindrical topknots that were placed on many moai. The Queen Victoria approached the island from the east just before 1700, passing the islands on the southwestern corner, and then turned towards the north to halt in front of the main city of Hanga Roa. Most of the population of around 6700 live in Hanga Roa. Having been told that large cruise ships were no longer welcome to visit because of their impact on the environment, we were surpised to find the Costa Luminosa at anchor and a procession of her tenders going ashore. Maybe there is a limit of one cruise ship per day. They helpfully sent a tender to evacuate one of our crew/passengers who needed to go to the island hospital. With binoculars it was possible to stare along the coast, looking for special features, especially the famous large standing moais. Tenders went into the little Caleta Hanga Piko, next to the airport runway lights, and there was a restored Ahu Riata which supports a solitary moai. Then the Caleta Hanga Roa, the fishing port, has Ahu Tautira with two superb moai. Finally Ahu Vai Uri supports five moai of varying sizes, and next is Ahu Tahai with a large solitary moai, and then Ahu Ko Te Riku with a topknotted and eyeballed moai. It was a pity the Costa Luminosa spoiled our view, and we could not get closer. 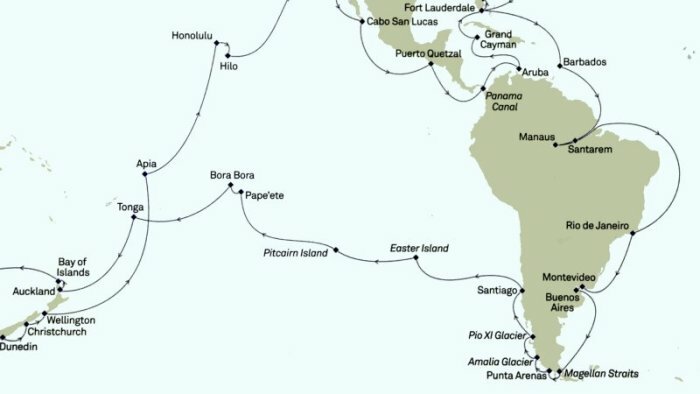 Instead of circumnavigating the island in a clockwise direction, as originally planned, the Queen Victoria turned back and proceeded to go counterclockwise. People with even-numbered balcony cabins vanished to get a good view. It was a pity that those eating early sitting dinner at 1800 missed the commentary from James Grant-Peterkin and the views. The Orongo ceremonial village, on the south west corner, overlooks the small islands of Motu Nui, Motu Iti and Motu Kau Kau. There was a bird cult linked to these islands whereby each year local people swam to them and waited for the Sooty Terns to lay their eggs. The competition was watched from a row of buildings on top of the hill and the first man to collect an egg won the prize that his tribe would be the rulers for the next year. The eastern end of the runway is indicated by the group of oil tanks. The island has an annual Tapati festival in February where the islanders form two teams and compete for who shall be crowned the Queen, including racing down the Cerro Pui hill on a sled of banana tree trunks. The next interesting feature was the Rano Raraku quarry with moai in various stages all over the southern slopes. There are some people walking around on the paths to set a scale. Our guide said there were 397 moai in various stages of progress. There are also supposed to be 20 standng moai within the crater and a small lake, but we could not see them from the ship. However,shortly afterwards we passed the famous Ahu Tongariki, the largest Ahu ever built and with 15 imposing statues. The eastern end of the island is high cliffs and the volcano Maunga Pu A Katiki which we had seen earlier. There are beaches along the northern coast and Anakena is a perfect white sand beach, changing colour in the evening light. It has easy road access and was full of people. There are also two Ahu here; in the centre of the beach Ahu Nau Nau has seven moai, some with topknots, and to the south there is Ahu Ature Huki with one moai. As the Queen Victoria turned the northern corner, and the Costa Luminosa came into sight anchored off Hanga Roa, we had completed our circumnavigation and it was time to get ready for dinner. This morning the Queen Victoria approached Pitcairn Island from the east, and then arrived in Bounty Bay next to the supply ship Claymore II. Pitcairn island is small, only two miles by one mile, and so is similar in size to Herm, but the terrain is much more rocky and rugged. Bounty Bay is not very large and it is difficult even for small boats to get inside the entrance to the wharf. Our tenders could not attempt it whereas their longboats have many years of experience dealing with the currents and breaking waves. There are three aluminium longboats. The largest is 13.45 metres long and therefore similar in length to our narrowboat, although wider. Pitcairn is famous because of the Mutiny on the Bounty. It was here that some of the crew of the Bounty, led by Fletcher Christian, arrived on 23 January 1790, and then settled. Christian's cave, set high up on the hillside, is where he was said to often visit. When they arrived the island was not inhabited. There were 9 men, 12 Polynesian women, one female child, and 6 Polynesian men who worked for the crew. When the island was rediscovered in 1814 there was only one surviving man, John Adams, who eventually died in 1829. The capital, Adamstown, is named after him. Ballast from the wreck of the Bounty, which was set on fire in order to hide the presence of the mutineers on the island, can still be seen in the clear waters. Other objects, particularly the anchor and a cannon, are in the museum. The story is told in the excellent Guide to Pitcairn, published by the Government of the Islands of Pitcairn. The island is the only British Overseas territory in the Pacific and when we visited there were only 43 people, descendants from the original crew of the Bounty, and 16 government officials. As we approached the local longboat headed towards the ship, full of the local people who were going to tell us about their way of life, sell souvenirs, and take some goods from us back home. We counted 36 people on board the longboat. Most of the population had therefore come to visit the Queen Victoria and much of the island income comes from selling souvenirs to passing ships. The island is governed from New Zealand, uses the NZ$ for currency, and the teacher, doctor and police come from there. There is a church, general store, museum, cultural centre, library, health centre, school and prison. The supply ship is funded from the UK, costing over NZ$2 million, and brings supplies and mail four times each year from NZ and provides a passenger service between the closest inhabited island, Mangareva, and Pitcairn twice before returning to NZ. Island life is therefore isolated and there is a close community and family spirit. It would not be a lifestyle which suits everyone. Children leave to be educated in NZ and some return to their home afterwards. There is also an active effort to attract immigrants. The schedule for the morning was that half of the ship attended a lecture at 0830 from Simon Young about life on Pitcairn, followed by the chance to buy souvenirs in the Queens Room. The other half of the ship went shopping first and then listened to Melva Evans at 1000. There was then a final chance for shopping before the islanders started to pack any unsold souvenirs away at 1115. They said it had been an early morning because the Claymore II had arrived with passengers who were going to stay on Pitcairn for a short holiday, and those passengers had to be disembarked and settled in to their accommodation before everyone set off to the Queen Victoria in the longboat. We guess they had been busy working since 0600 and everyone appreciated their visit, and the welcome to us from their island. They left at 1230 and we steamed away towards our next port, in French Polynesia.